Jhana breastfeeds her daughter Gwendolyn in Tacloban. United Nations agencies are promoting breastfeeding to avoid unnecessary illness and deaths of children in the wake of the disaster wrought on the Philippines by Typhoon Haiyan (Yolanda) earlier this month. “The estimated 12,000 babies to be born in the worst-affected areas this month need to be exclusively breastfed, meaning that they get nothing but breast milk, which protects them from potentially deadly infections,” the UN Children’s Fund (UNICEF) and the World Health Organization (WHO) said in a joint news release issued yesterday. They said that around one third of babies in the area born before the disaster who are less than six months old are already exclusively breastfed, and nine out of ten were at least partially breastfed before the emergency. The mothers who were doing at least some breastfeeding need to be supported to transition to exclusive breastfeeding. “The uncontrolled distribution and use of infant formula in emergency situations like this – where there are serious water and sanitation challenges and other disease risks – is extremely dangerous,” said Dr. Julie Hall, WHO Representative in the Philippines. During emergency situations, disease and death rates among babies and children are higher than for any other age group, the agencies noted. Babies who drink formula made with water that is contaminated with germs or given with an unsterile bottle or teat, can become very sick with diarrhoea and die within a matter of hours. “Feeding babies with formula in emergencies must only be considered as a last resort, when other safer options – such as helping non-breastfeeding mothers to reinitiate breastfeeding, finding a wet nurse or pasteurized breast milk from a breast milk bank – have first been fully explored,” they stated. UNICEF and WHO strongly urged all who are involved in funding, planning and implementing the emergency response in the Philippines to avoid unnecessary illness and death by promoting, protecting and supporting breastfeeding. Community leaders are called on to monitor and report any donations that may undermine breastfeeding. Some 14.4 million people are affected by the typhoon, which also displaced about 3.6 million people. Ongoing priority needs include food aid and access to water, urgent and extensive shelter requirements, and recovery of livelihoods. Meanwhile, medical teams organized by the UN Population Fund (UNFPA) have started delivering reproductive health services to expecting and nursing mothers in evacuation centres for those displaced by the typhoon. 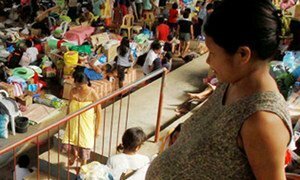 The first medical missions, on 26 November, went to the two largest centres in the devastated city of Tacloban where 44 pregnant women and 33 breastfeeding mothers received care. Each was tested for vital signs, given a gynaecological consultation and a test for infections. Pregnant women were given prenatal exams, including ultrasound. In addition, midwives dispensed medicines and information about family planning methods. A counsellor was available for women showing signs of psychological trauma. The team went to two more sites yesterday and served clients from 14 evacuation centres. While all of Tacloban’s medical facilities were heavily damaged by the typhoon’s fierce winds and tidal surge, a number have reopened and are now able to provide safe delivery services, including three that can provide caesarean sections. There are some 230,000 pregnant women among the millions affected by the typhoon. Nearly 900 are giving birth each day, with around 130 likely to experience potentially life-threatening complications, according to UNFPA.